Friday May 28th 1926 Hattie and I busy getting things ready for the rummage sale tomorrow. Cora took us down early in afternoon. I was there part of afternoon. Hattie went with me to Strohs store where I selected a couple of pretty dresses. Came home with the girls to supper. Rode to Mrs Moores after supper with Rob. 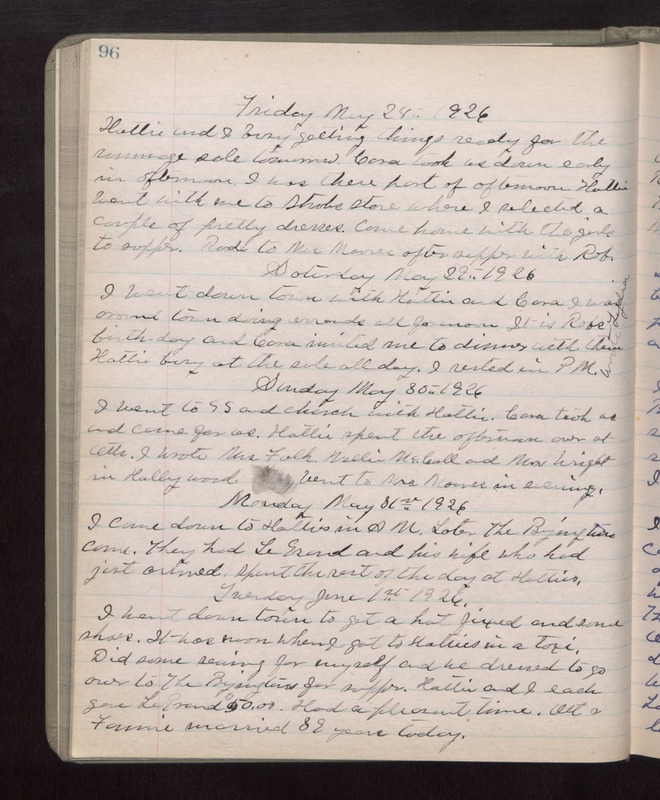 Saturday May 29th 1926 I went down town with Hattie and Cora. I was around town doing errands all forenoon. It is Robs birthday and Cora invited me to dinner with them. Hattie busy at the sale all day. I rested in PM. Wrote Lydia. Sunday May 30th 1926 I went to S S and church with Hattie. Cora took us and came for us. Hattie spent the afternoon over at Otts. I wrote Mrs Falk, Nellie McCall, and Mrs Wright in Hollywood. Went to Mrs Moores in evening. Monday May 31st 1926 I came down to Hatties in AM. Later the Byingtons came. They had LeGrand and his wife who had just arrived. Spent the rest of the day at Hatties. Tuesday June 1st 1926 I went down town to get a hat fixed and some shoes. It was noon when I got to Hatties in a taxi. Did some sewing for myself and we dressed to go over to The Byingtons for supper. Hattie and I each gave LeGrand $50.00. Had a pleasant time. Ott & Fannie married 39 years today.